Have you ever asked yourself: Why some anglers get on fish when you can't when fishing, what seems to be the same point, ledge or hump? Well, they look at that particular piece of structure and break down where it gets pressured the most and look at underutilized sections of it. That sounds easy enough until you try it. Here comes into play your mapping, sonar, down- and side-imaging skills. Look at your structure on your mapping first. Look at the contour lines that are wider and appear to be the base near cove openings, creek mouths or drop into the main river channel. Run over that area and look for bait fish. Follow up by your down- and side-scanning the area. You are looking for sparse rock boulders, rock veins and brush piles; anything that may hold fish in what to most looks like a barren waste land. Mark those spots. Bait and bass respond by moving on structure that sees less pressure. Look at wind and current flow when lining up on those prime spots. The bass holding here will respond better to what appears to be a natural presentation. Again, mostly due to heavy pressure by anglers. Now on to lure selection. This is where you must commit to the "Hero or Zero" mentality. First lure of choice, a big spoon being cast out and worked very aggressive with hard overhead rips. I am talking about over your head rips and letting the spoon fall on a controlled slack line using a 7-foot, 6-inch or longer rod. Next the ½- to ¾-ounce large hair jig. Work it by slow hoping it along the bottom with several violent rips on the retrieve back. Next, attempt to swim it back slow rolling it with sudden pauses. Most hits will be on the fall. Large football jig 3/4 to 1 ounce. This is the time not to slow drag it. Slow roll it along the bottom making contact with whatever you can with sudden pauses. You can also stroke the jig with one or two very hard pumps and letting it fall on a slack line. Hits will occur mostly on the fall. Swim baits on heavy swimbait heads. 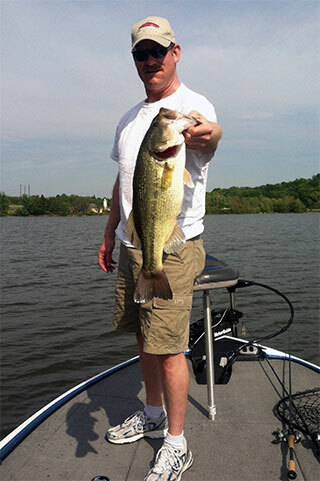 Use 5- to 7-inch swim baits on ¾- to 1 ½-ounce swimbait heads. Slow rolling them with sudden pauses is very popular. However, more pros are stroking them like jigs with great success. Force yourself to really work your target area; this takes time to do it right. You are attempting to get fish to strike out of pure reaction to your bait. This summer take the time to examine some of your favorite holes. Pick a few to dedicate trying these methods. Who knows you may like that hero feeling after all.